Outsourcing relieves financial accounting issues promptly. It allows you to maintain a lean organization while enjoying the assistance of highly experienced financial accounting professionals. 6 Reasons Why CEOs are Outsourcing Their Accounting – At first the idea of outsourcing may seem uncomfortable, especially when it comes to something as sensitive as your company’s financial accounting. However, it might also be the best decision you make for your business. Increasingly outsourcing is becoming this century’s best practice among savvy leaders keen on protecting their company’s profits. 1 – Access to the right mix of accounting expertise – When you outsource your accounting to Edward Thomas Associates, you immediately have access to experienced, accredited, professional accountants. In fact, you have a team of accountants handling your accounting activities. There’s no mismatch of skill and activities. We’ll assign bookkeepers to handle your bookkeeping, and when you need the attention of a Controller or the council of a CFO, you’ll have access to them – this is what is meant by fractional accounting. 2 – Better return on investment – The hiring process is always time-consuming and frequently costly and frustrating. There is a hefty cost in terms of salary and benefits. With the country at near full employment, available candidates are often disappointing. When you outsource, you are pay a monthly fee that annually would be roughly the equivalent of the salary of one full time employee (FTE). However, Edward Thomas Associates is always at work for you (no vacations, PTO, or sick time). With a FTE, you are limited to the skill set and experience of that one individual. 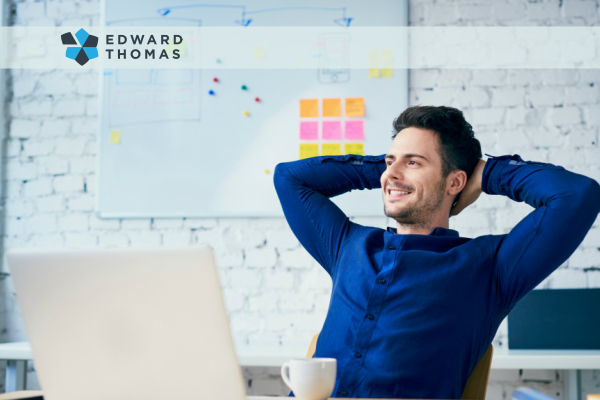 With Edward Thomas, your accounting team brings decades of experience from a rich variety of business models and industries. 3 – On Time and Accurate Financial Reporting – Stale information or worse inaccurate information is an impediment to both your personal aspirations and your goals for the company. Working with Edward Thomas you’ll enjoy accurate, on-time financial reporting. You’ll enjoy the confidence that comes with data-driven decisions. Seizing opportunities, quickly addressing problem areas, and moving the business forward is accelerated when there is optimal management of your financial accounting. 4 – You get stronger internal systems – Outsourcing your accounting function to a third party actually serves to make your internal controls (such as separation of duties) more robust and increases your accountability and transparency. We are up-to-date on the latest accounting best practices and use this knowledge on your behalf. We review internal processes (for example expense approvals) and create automated workflows that enhance efficiency. 5 – Accounting Technology – Technology is a critical ingredient in every department of your business and accounting is no different. We are experienced and certified on the accounting technology tools we use on your behalf. Not only does the proper application of technology ensure accuracy and lower costs, but you will have real-time information available to you any time, anywhere. If you have access to a browser and the Internet, your financial accounting information is just a login away. You’ll love the customizable dashboards we can make available – critical data at a glance and in real time. 6 – You save costs – Outsourcing allows you to save costs on a variety of things, including technology investments, office space, benefits, and salaries. But perhaps more importantly you save time and gain continuity. No more time wasted recruiting, hiring and on-boarding candidates. There’s no need to hire a full time Controller or CFO when there’s not a full-time need for that level of experience. Edward Thomas Associates provides a range of accounting services and ensures your company’s financials are always working. Our fees are affordable and we offer the latest systems and technologies to ensure you are always on top of your game.